The reference was an old grainy version of a photo taken of Richard when he was 28 years old, seen here by permission of Mark Tucker. If you're not interested in boring technical talk about painting, you can skip the rest of this page. . . I have been learning to use milk paint, a form of paint so ancient it can be found in the tombs of the Egyptian pharoahs. It needs a rigid, absorbent surface, so wood is perfect. My son made me a smooth basswood panel for my birthday. I decided to paint a portrait of my friend RichardMullins on it. This is my first fine art painting using milk paint, so I learned a great deal. Milk paint is demanding, but it's also forgiving. It's an emulsion, so you can mix virtually any liquid in with it: oil, water, alcohol. I like to use glazes, and I found alternating a layer of borax, skim milk, and pigment a layer of milk paint made with lime and beer was an effective way to use the paints. Layering base and acid back to back lends a strong bond to the paint and prevents flaking. I also found that adding successively more oil to the paints in the top layers prevents cracking. In oil painting, we call this "working fat over lean." Eventually, the layers need to dry. After the oil-heavy layers dried, I needed either to work strictly in oil, or to form a new ground to accept a thin wash of milk paint or a glaze without cracking. I found Borax dissolved in milk works well for forming a new ground over an oil layer. It's also a nice transparent glue for areas where the paint has (oops) cracked. The pigments are mostly French provincial ochres, some minerals, but one local Appalachian ochre also appears. A friend gave me a beautiful jar of deep coppery brown ochre, which I have used as a common element of the skin tones. Richard had the most amazing color. I began to use a clear walnut wax as a resist on areas I wanted to keep intact as I worked. The theme of an icon turned up early in the painting; partly because of the wood surface, which is traditional for an icon. 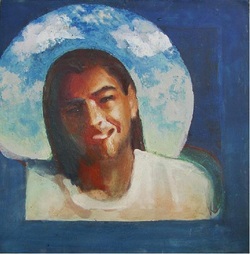 It was a pun originally: Rich Mullins the CCM icon--but as I worked I began to enjoy the intention of a visit from my friend, as though he is looking at me through a window of the place he inhabits now. The background is a deep sky color, perhaps the sky at night, or the color of heaven. The ingredients I used in making paints and glazes reads like a grocery list. Olive oil, vegetable oil, cooking spray, skim milk, Sierra Nevada pale ale (which my adult sons don't seem to like; it's been in the refrigerator since Christmas), white vinegar, quark, and other common kitchen ingredients came into play. At one point, I painted myself into a corner, so to speak. I had a strong dark surface over the face, and strong highlights. But I had pushed too far with a final layer of glaze and lost the middle ground. I faced two more weeks of building up the middle tones of the face, which was discouraging. I'm not very patient, which is another reason I've liked milk paint. It tends to work fast, unless you blow it like I did. The adhesion of milk paint is so good and the drying is so quick, you can't scrape your mistakes off as easily as you can with oils. You have to wait for them to dry and paint over them, or sand them down. Sanding usually removes far more than you want it to. So I said a prayer for help and finally went to bed. Just before I woke up, I had a dream about using pigmented melted wax to reconstruct middle tones on the face. The melted wax in my dream looked so smooth, I was sure it would work. The next day I researched icons and found they had often been painted with encaustic--melted wax. I looked at the Fayum funeral portraits for tips. I was ready to give it a try. I decided to spare my brushes as much as possible from the wax. Brushes are by far the most expensive tool an artist uses. I melted down a very fine layer of wax in my wax skillet and swirled a pinch of pigment in. A little goes a long way. I threw the pan in the refrigerator for a few minutes then carefully scraped the cold wax up into small razor-thin sheets. I applied tiny thin sheets of pigmented wax to areas of the face. Very nice, easy to place exactly where I wanted them--or try them out here, then move them around there. It was almost like creating a mosaic, which may be how Greek artists, masters of mosaic, originated the wax portrait technique. I fixed the wax on with an iron, then decided to heat the pallate knife on the iron for greater control. The wax cools in a few moments, compared to several days of drying for an oil-heavy paint layer. I was easily able to paint over the wax layer with milk paint containing oil. Blending colors on the face after applying wax was as effortless as breathing. Paint over the wax layer resembles impasto, which adds a touch of texture to the surface of the painting that milk paint tends to lack. I liked using an eclectic blend of painting techniques borrowed from different periods of history--early Christian era, medieval, Old Masters, impressionist. The range of influences seems appropriate to Richard's wandering blend of musical styles. Grateful to have the opportunity to use these techniques. Grateful to have known Richard. Grateful to have shared this moment with him. Grateful to know where he is now. Grateful to look forward to the reunion this painting celebrates.